The Holy Trinity – Three Veggie Recipes for EASTER! I am pumping my brakes a little on my super skeezy blog posts as I just found out at Easter dinner that my mother-in-law is one of my biggest fans. I don’t have it in me to write about hairy girly bits, penises of all shapes & sizes or sexual encounters from around the globe – sorry Mom you will have to wait until next post to pray for my soul. Another thing to mention is my dear friend Andrew Burke McIntyre has told me to put more links in my blog. So, Andrew, click away! And if any of you have complaints you can email Andrew directly at imreallyimportantnow@gmail.com really go ahead email him!! Anyway, Easter was lovely, thanks for asking. We visited with friends and family all weekend which gave us a lot to talk and laugh about as well as many opportunities to eat veggies!! For Easter dinner, I was assigned the VEG. So, I whipped up three very veggies dishes. 1) Parsnips & Carrots, from my January 18, 2011 post. Since parsnips and an aphrodisiac I must interject with a little dirty easter joke. Its gonna take me a while to get hard I just got laid by some chick. Damn, it is impossible to keep it clean! 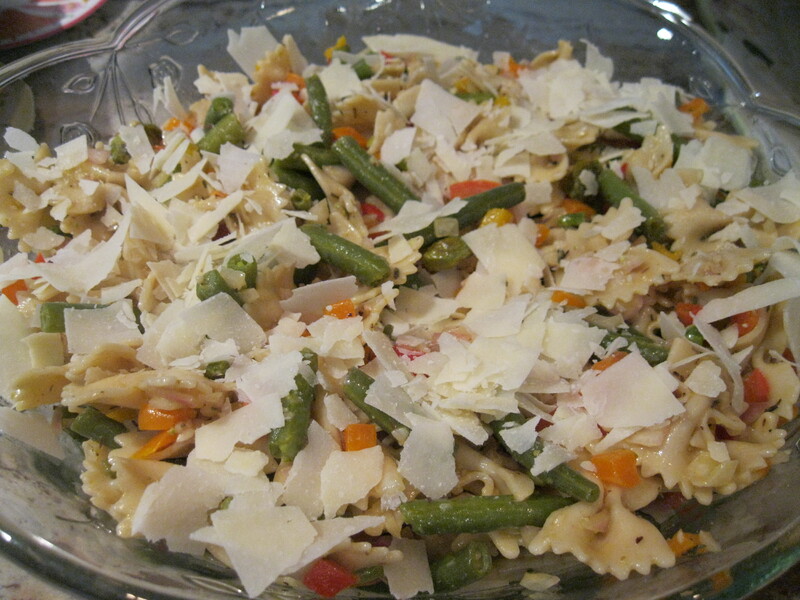 Note: I used whole wheat bow-ties (cause they were cheaper & healthier) and haricot verts (cause I am that upscale!! ), plus I added multi-colored peppers to veggie-it-up a bit! And finally, this delicious take on Tomatoes Caprice using strawberries instead! 3)Strawberries and Fresh Mozzarella with Mint Pesto Drizzle, a summer staple, courtesy of Family Circle!! Well, that was our linkable lovely Easter. Try these recipes and let me know what you think they are all really YUMMY! For anyone who misses the dirty veggie posts tune in next week, or check this out!